Buy it for school, use it for life. Physical Therapy kits are designed to meet the needs of physical therapy students. The kit is pre-packaged with items physical therapy students need in their classes and as a professional. 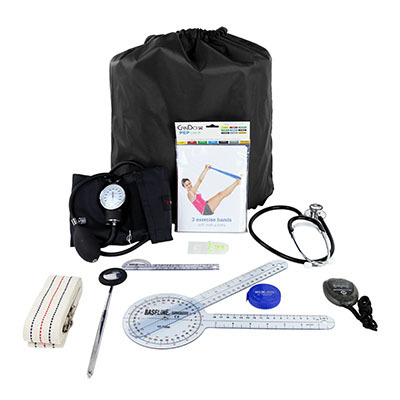 Physical Therapy Student Kits are designed to meet the needs of physical therapy students. The kit is pre-packaged with the items physical therapy students need in class and as a professional. 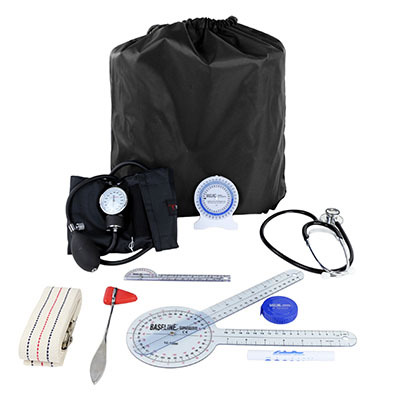 The kit includes one of each: Baseline® 12" 360° clear plastic goniometer, Baseline® Absolute+Axis® attachment, Baseline® 6" 180° clear plastic goniometer, Taylor hammer, Baseline® pocket aneroid sphygmomanometer, dual-headed stethoscope, Baseline® woven measurement tape, 24-hour electronic stopwatch/watch combination, FabLife® 72" gait belt with a metal buckle, and a drawstring bag. 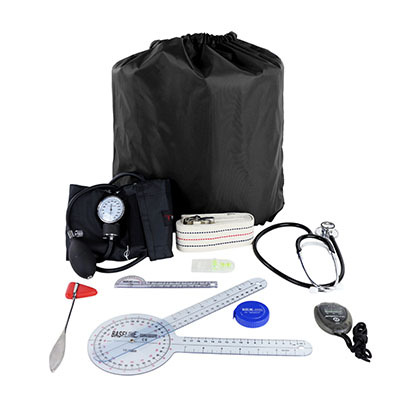 Dimensions: 11" x 5" x 11"
Physical Therapy Student Kits are designed to meet the needs of physical therapy students. The kit is pre-packaged with the items physical therapy students need in class and as a professional. 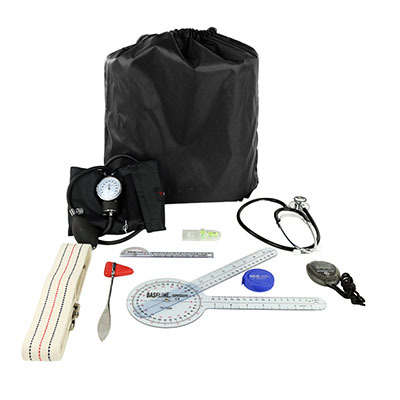 The kit includes one of each: Baseline® 12" 360° clear plastic goniometer, Baseline® Absolute+Axis® attachment, Baseline® 6" 180° clear plastic goniometer, neurological (Buck) hammer, Baseline® pocket aneroid sphygmomanometer, dual-headed stethoscope, Baseline® woven measurement tape, 24-hour electronic stopwatch/watch combination, FabLife® 60" gait belt with a metal buckle, CanDo® PEP Pack® (easy), and a drawstring bag. Physical Therapy Kits are designed to meet the needs of physical therapy students. The kit is pre-packaged with the items physical therapy students need in class and as a professional. 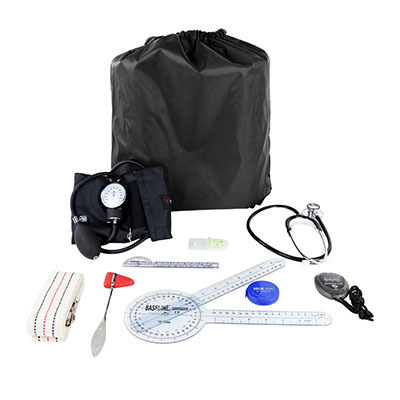 The kit includes one of each: Baseline® 12" 360° clear plastic goniometer, Baseline® 6" 180° clear plastic goniometer, Baseline® pocket aneroid sphygmomanometer, dual-headed stethoscope, Taylor hammer, FabLife® 54" gait belt with a metal buckle, pen light, Baseline® Bubble inclinometer, Baseline® woven measurement tape, and a drawstring bag. Physical Therapy Kits are designed to meet the needs of physical therapy students. The kit is pre-packaged with the items physical therapy students need in class and as a professional. The kit includes one of each: Baseline® 12" 360° clear plastic goniometer, Baseline® Absolute+Axis® attachment, Baseline® 6" 180° clear plastic goniometer, Taylor hammer, Baseline® pocket aneroid sphygmomanometer, dual-headed stethoscope, Baseline® woven measurement tape, 24-hour electronic stopwatch/watch combination, FabLife® 54" gait belt with a metal buckle, and a drawstring bag.